The last couple of weeks have been a little more stressful than usual due to a perfect storm of proposals, projects, and personal stuff. And because I have a tendency to internalize my frustration and stress, this trifecta really took a toll on me both emotionally and physically, and I swiftly found myself running on the dregs of my usually indomitable enthusiasm. But as often happens, I was reminded of a song, which set me on the path to getting myself sorted out again. 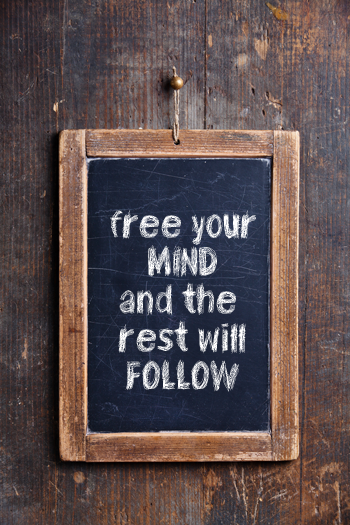 Believe it or not, it was actually the chorus from En Vogue’s “Free Your Mind” that went skittering through my thoughts, sending me down a path of introspection about what it means to “free your mind” that helped me get back on track. I think it’s easy to fall for people to fall into patterns of thought and even easier to move from those patterns into making assumptions about life, the universe and everything. Because your life has a certain ebb and flow, a routine – you take some things for granted, because you experience them every day. They’re a constant, and so they occupy very little of your conscious thought. Need an example? How many times have you been on the road, lost in thought, and when you become aware of your surroundings again, you found you were much further along or heading in a different location than you last remember? Your mind turned on cruise control, and you were just along for the ride. Cruise control can sometimes be a handy thing. It allows you to free up and focus your attention on tasks that require more attention to detail, but it can also blind you to some warning signs that you’re heading off in the wrong direction. For me, it wasn’t until Chris called me out for being uncharacteristically negative in a situation where I would have usually responded with empathy that I realized that my pattern of thought for the past month had been taking a more pessimistic bent. And because your brain is trained to pave larger paths to the things you’re thinking most often (it tries to be helpful like that), thinking negative thoughts leads to dwelling on negative thoughts leads to being infused with negativity overall. Thankfully, once aware of what I was doing it was pretty easy to take steps to “fix” myself. I spent this past weekend convalescing – both physically (I wasn’t kidding when I said the long hours and stress had taken a toll), as well as emotionally. My weekend’s accomplishments included spending time with my family (and niece! ), reading two books, and finally playing a game I’ve been dying to get my hands on for months – Ni No Kuni: The Wrath of the White Witch. The result? After a weekend of focusing on the positive, my spirits are up, I feel better than I have in over a month, and I’m ready to tackle whatever comes my way. After all, at the end of the day, you can either focus on what’s tearing you apart or what’s holding you together. Your attitude and approach are what make all the difference. So friend, this week I challenge you to free your mind. You’ll be glad you did.